Skin is the most visible and largest (by weight) organ in the body, with an amazing 22 square feet of surface area. The skin is sometimes called the third kidney, because it helps regulate fluid and helps the body detoxify. Unless it’s clogged with more toxins than it can handle. During the summer we show and see more skin, and we’re advised to slather on sunscreen. Be careful. Many sunscreens contain questionable ingredients that may be harmful to your health. Buy only health-enhancing skin care products, because what you put on goes in, just as if you ate it. In fact, applying skin care products with questionable ingredients may be even more dangerous than eating them, since the digestive tract has more ability to detox harmful substances. Going through your skin, chemicals bypass digestion and go directly into your lymphatic fluid and bloodstream. Everyone needs some sunlight for health. It’s all about balance. When you need to block excessive sun exposure, use safe methods: wear a hat, avoid being outside during the hottest part of the day, and wear lightweight long sleeves and pants when necessary. In addition, eat plenty of antioxidant-rich foods and Vitamin C, which may protect your skin from radiation and free radical damage. One in four Americans has a skin disease, with 85 million affected each year. Nearly half of Americans over age 65 have a skin disease, with an average of 2.2 skin diseases each. Some skin ailments are not contagious, such as eczema, rosacea, psoriasis, moles, skin tags, and the rash from poison ivy. Eczema, a general term that refers to inflamed, itchy, rough skin, affects a whopping 35 million in the U.S. (1-3% adults, 10-20% children). More than half of all eczema cases are called atopic dermatitis (AD). About 90% of all cases are diagnosed in children under 5, with 65% of those diagnosed before age 1. Although most people outgrow it, between 10% and 30% continue to have relapses into adulthood. Dr. King’s Eczema Symptom Relief is a 100% organic and homeopathic topical lotion. It safely helps relieve symptoms of inflamed, itching, scaling, thickened, skin with dry or moist skin eruptions. Psoriasis, which affects 7.5 million in the U.S., is a chronic autoimmune disease that speeds up the growth cycle of skin cells. Psoriasis causes patches of thick red skin and silvery scales, typically found on the elbows, knees, scalp, lower back, face, palms, and soles of feet, but it can also affect other areas (fingernails, toenails, and mouth). The most common type of psoriasis is called plaque psoriasis. Psoriasis is the most prevalent autoimmune disease in the U.S. It most often appears between the ages of 15 and 25 but can develop at any time. Psoriasis affects Caucasians twice as often as African Americans, and if one parent has it, their child has a 10% chance of having it. If both parents have it, their child has a 50% chance of having it. Dr. King’s Psoriasis Symptom Relief is a topical lotion that is 100% organic and homeopathic, so it’s safe for your skin (and body). It relieves rashes and thickened, red, itching, scaling, and crusting skin. Sixteen million people in the U.S. suffer from rosacea. Symptoms may begin with the tendency to blush or flush more easily than others. But more than redness of face, chest, ears, and back, it can also cause acne-like breakouts, and thicker skin on the eyelids and the end of the nose. It can cause visible, broken blood vessels on the face, spider veins, and red, bumpy, stinging skin. As you can imagine, this condition can cause anxiety, frustration, low self-esteem, and embarrassment. Dr. King’s Rosacea Symptom Relief is our 100% organic and homeopathic medicinal lotion formulated to relieve facial redness and swelling, pimples, itching, burning skin, and hot, stinging dermatitis. The Latin translation for poison ivy is Rhus toxicodendron (Rhus tox for short). We all know the symptoms and hopefully not from firsthand experience! A common misconception is that, even after showering with warm, soapy water, the rash and fluid from the oozing blisters are contagious. They’re not. Only the undiluted uruishiol oil from the plant, directly on the skin of some individuals, causes the symptoms. This plant offers a beautiful example to help people understand how homeopathy works. The oils of poison ivy create a violently itching and oozing rash in many people. However, taking a tincture of that toxin and putting it through a homeopathic series of dilutions and succussions (vigorous shaking) creates a submolecular remedy for that toxin. The energetics and nanoparticles of the medicine is enough to awaken the body to overcome the reaction, yet not enough to cause any negative side effects. Plus, homeopathy helps your body release the toxin within, as well as not react so violently if exposed to it in the future. It’s the perfect medicine! And when you realize that a toxin holds the key to the cure, you realize that there’s no pollution problem that homeopathy can’t address. It works on all living organisms, including plants! Dr. King’s Poison Ivy & Oak Relief is a pure water based oral spray that relieves skin irritations related to poison ivy, poison oak, poison sumac, detergents, cosmetics, or other irritants that cause: minor swelling, itching, burning sensation, rashes, and skin eruptions with oozing. Three sprays in the mouth is one dose and may be taken as needed to relieve symptoms. Moles are very common and are darker areas of skin (brown, tan, or black). They may be flat or raised, round or oval. Almost every adult has a few of them. Asymmetry – one side doesn’t match the other part. Border – the edges are notched, fuzzy, or ragged. Color – 2 or more colors inside the border makes it more suspicious. Diameter – bigger than the end of a pencil erasure. Evolving – it noticeably changes in shape or color. If a mole suddenly appears, or an existing mole starts to itch, grow, or bleed, immediately see a dermatologist. A melanoma skin cancer usually does not cause pain, so use the ABCDE to remember the warning signs. Dr. King’s Mole Remover is a topical oil that comes with a brush applicator inside the bottle lid. It’s very convenient and is a top seller. 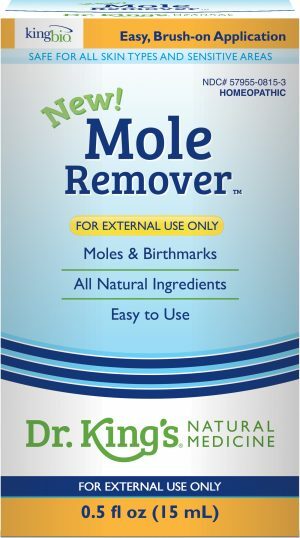 Dr. King’s Mole Remover is formulated for symptomatic treatment of moles, birthmarks, brown spots, and freckles. Apply the medicine 3 times per day, and the mole will dry and flake away over a period of 3-6 weeks. Skin tags are small, soft skin growths with a short, narrow stalk that sticks out. They often look like tiny little flaps of skin that hang away from the skin. They can appear anywhere that skin rubs on skin, such as around folds of the neck, breast, upper chest, underarms, groin, and even eyelids. When cut, they bleed profusely. The cause of skin tags is unknown, although friction or the human papilloma virus (HPV) may play a role. Insulin resistance, which may lead to type 2 diabetes and prediabetes seems to play a role, since multiple skin tags appear in those with high body mass index, insulin resistance, and high triglycerides. Hormone imbalance also seems to play a role, since they often appear during pregnancy and its associated weight gain. Skin tags are painless, considered harmless, are not contagious, and do not become cancerous. Still, cosmetically, most people want to be rid of them. 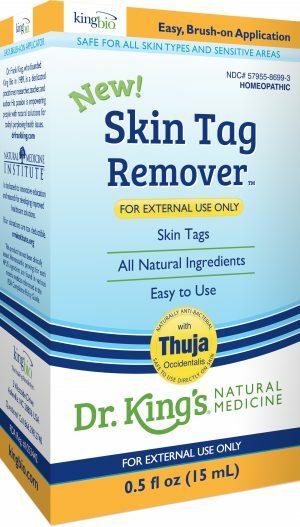 Dr. King’s Skin Tag Remover is a topical medicinal oil that comes with a brush applicator inside the bottle lid. Apply medicinal oil 3 times per day. Skin tags will dry and flake away over a period of 3-6 weeks (sometimes within 10 days). Warts are contagious. Warts are caused by the human papilloma virus (HPV). The HPV is very common and has more than 150 types, but only a few cause warts on the hands. Common warts are usually caused by the virus entering the top layer of skin through a tiny cut. Common warts are usually harmless and eventually disappear on their own. Warts can be spread by picking at them; using the same clippers, pumice stone, or emery board on a wart and another part of the body; or by biting your nails. Not everyone who comes into contact with the HPV will develop warts. People with weakened immune systems and children with immature immune systems are most at risk. Dr. King’s Wart Freee… is an oral spray with nine homeopathic ingredients in three potencies each for a total of 27 remedies in one bottle! 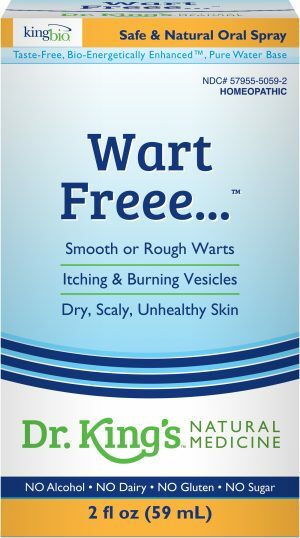 The Wart Freee… is formulated to naturally overcome: smooth or rough warts, itching, burning vesicles, dry scaly, unhealthy skin, fig-warts, and warts on hands, face, or nose. Three sprays in the mouth is one dose. Note: We also manufacture a topical-only oil called Wart Remover, which is not to be used orally. How contagious something is (or is not!) always depends on the strength of your immune system. There’s absolutely no reason to be afraid of a big, bad world of germs and viruses that are just lurking “out there” to snag you and knock you down. It all comes back to keeping yourself healthy and your immune system strong. That’s what The Healing Revolution and the Eight Essentials are all about. If you do develop a symptom or two, non-toxic homeopathic medicine can get you back on track safely. So, fear not.